A linear actuator is a device that creates a horizontal movement because of the circular motion of an electric device or a motor. Actuators can be used in various industrial machine designs and applications. Certain mechanisms are used to generate the linear motion, which include pneumatic, hydraulic and mechanical systems. The different kinds of actuators applied in electric lifts in order to control the table via iPad include the electric actuators, mechanical actuators, pneumatic actuators and hydraulic actuators. In this kind of linear actuator, a piston and hydraulic cylinder translate the vertical motion of the piston inside the cylinder and converts it to a rotary motion of the shaft. The shaft that has a threaded part then advances the complementary section of the crankshaft to which the turntable is attached. This translated motion would then push the table downwards or upwards as desired by the device operator. The initial motion of the piston cylinder is then controlled by an electrical circuit, which in some cases can be controlled by an iPad. However, it is important to note that the hydraulic pump could control the hydraulic actuator. This type of linear actuator uses the piezoelectric effect in its application, whereby some materials or substances expand when they are applied to a voltage. This device has an exceptional resolution that makes them suitable for application for lifting the table in short lengths or distances. The main feature of this system that can be controlled using iPad is the voltage across the piezoelectric material. In this type of actuator, the main translation is that of linear motion or rotary motion. Certain mechanisms like screws, cams, pinion and track systems can be used to create the translational motion. In the screw model, the rotary motion of the of the screw would be applied to cause the linear motion of the crankshaft, which is also threaded. In the case of cam actuators, the circular set-up of the cam would convert the movement of the wheel attached to it, which in turn produces a linear motion although the magnitude of the lateral travel is limited. On the other hand, the rack and pinion system works differently. The horizontal rack with the gear teeth is carved out in a way that it causes a horizontal motion that the vertical position of the gear rotates. It is important to note that then the table is lifted as determined by the length of the rack. The mechanical actuators are automated using a remote application using the iPad applications. The pneumatic actuators have a piston running through a hollow cylinder. The manual pump or external compressor causes pressure that moves the piston. An increase in pressure moves the cylinder that creates a linear force. In order to return the piston to its original place, a spring-back force is used or a fluid supply on the opposite side of the piston. 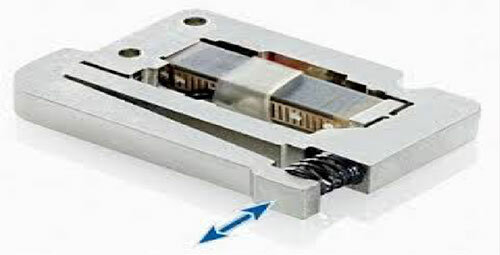 The advantage of the pneumatic actuators is that they are simple to use. Pneumatic actuators have gone through advances such as miniaturization, integration with electronics, materials, and condition monitoring. The force applied to this linear actuator causes a linear motion that can be improved by the motor and controlled remotely using the iPad applications, which can be installed within the systems. Next: The Best Approach Should You Choose – Adaptive Design OR Responsive Design? Could Phone Contracts Be on Their Way out?